​ ​The Baptist Church in Warren was organized on November 15, 1764 with the Rev. James Manning of Princeton, New Jersey, as the first pastor. At this same location the same year brown university, then constituted as Rhode Island College, was established with Rev. James Manning as its first president. The first house of worship was completed around 1764, too. It was about forty-four feet square with a four-sided hip roof, surmounted at the top and center with a small belfry, in which was placed a ship bell, the rope of which hung directly down in the center of the middle aisle. ​In 1778 the British troops burned the first meeting house along with the parsonage, a spacious mansion serving a double purpose as a home and college. The troops of the crown took the pastor as their hostage. A second church edifice was erected in 1784 on the spot of the former church. A steeple was added in 1800. As years passed a larger meeting house was needed. In 1844 our present stone edifice was erected by the Benevolent Baptist Society. The building has fourteen arched windows extending twenty-four feet high. There are a hundred and forty-six pews arranged in three double rows. The pews are finished combed oak and capped with black walnut railings. In these early days pews were sold to the members. Between 1860 and 1884 the pews were allowed to be rented too. In 1964 our church pews were appraised at $20,000. ​ The bell which hangs in the belfry today is a recasting of the first bell which was made by the famous Paul Revere of Boston in 1800. A photostatic copy of the bill of sale signed by Paul Revere can be seen in our museum-library. 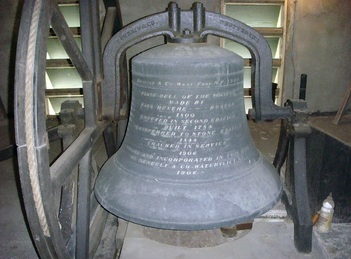 The bell was erected in the second edifice and transferred to our present building in 1844. In 1906 a crack was discovered in the bell; and it was recast that same year by Meneely and Company in Watervliet, New York. Frank S. Drowne, in repeating the tradition of Nicholas Campbell at the casting of the original Revere bell, threw in a liberal amount of silver dollars to contribute to the purity, richness, and sweetness of the bell’s tone. 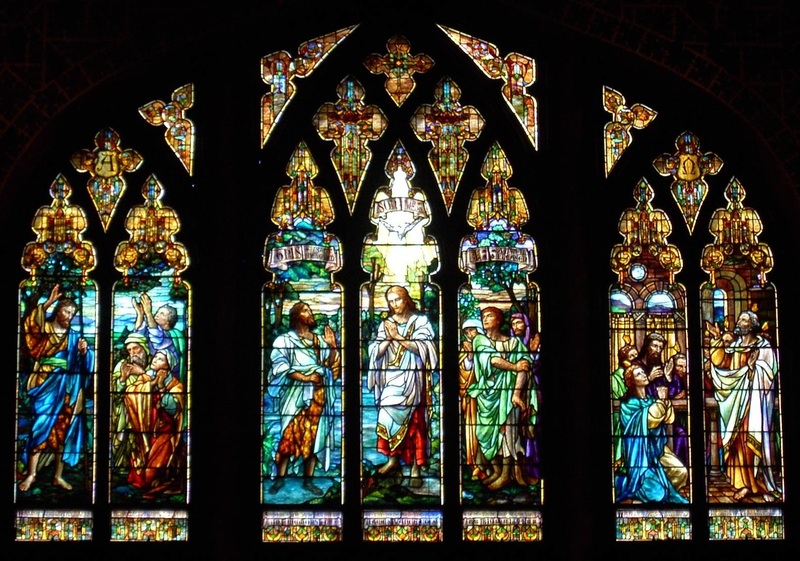 The stained glass window in the chancel and the chancel itself were made possible by James Vance Cole as a memorial in his honor. These were added to our house of worship in 1913. The window features the pictorial, decorative style. It is made according to the American (mosaic) method, i.e. the colorings, lights, and shades are produced in the opalescent glass. Only those areas are painted which depict the features of figures such as the flesh and heads. 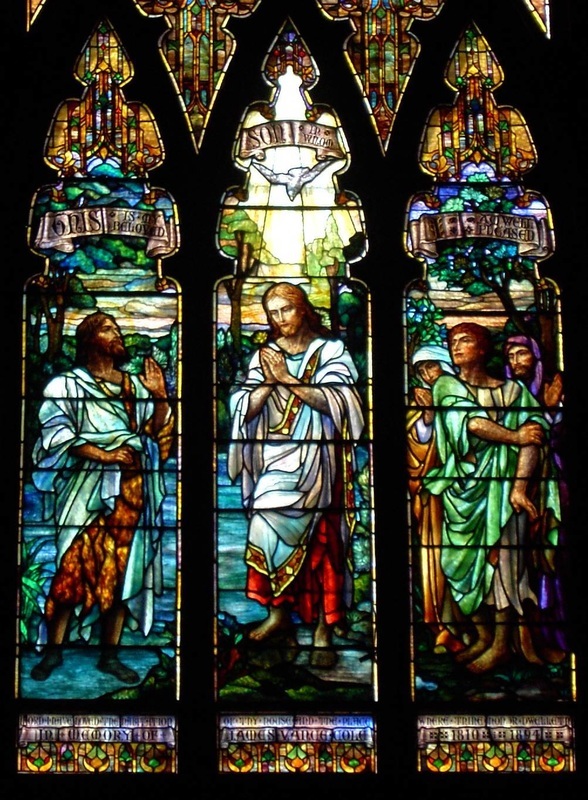 The design of the window was created by the artists and craftsmen of the Gorham Co., New York, under the direction of architect Arthur Eaton Hill. ​The chancel window is an amplified treatment of the aisle windows in style, being divided by mullions into seven panels or lights with heavy mullions further dividing it into three sections, two panels each, right and left, and three in the center, the heads of these panels and nine tracery openings above them having an ornamental canopy effect with the symbols of alpha, omega, and the cross. In the panels, figures occupy most of the space, with landscape, or structural treatment, completing the subject matter portrayed. 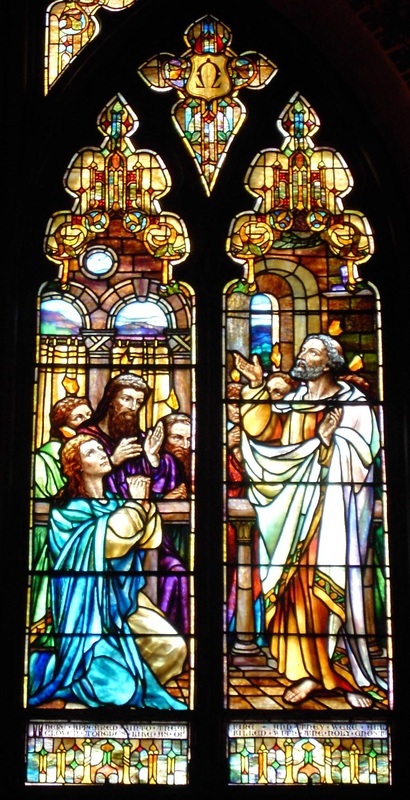 The window preserves for us the essence of the Baptist tradition, that is, that the church is made up of believing servants of Jesus Christ who have repented of their sins and who have made public confession of their faith in him as lord and savior through the rite of Christian baptism. 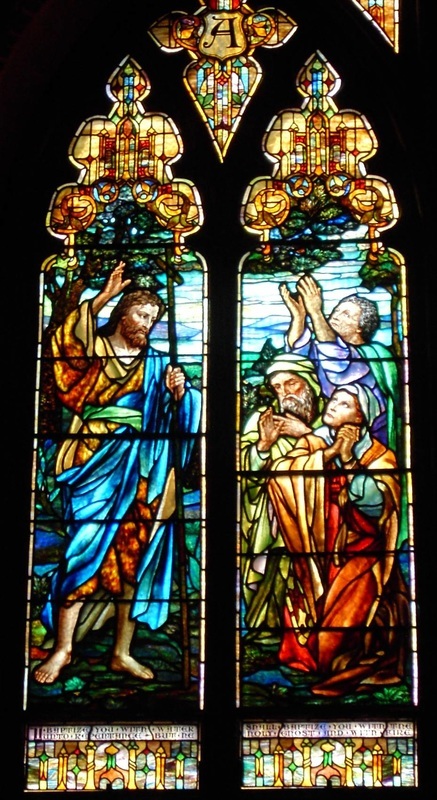 ​​​ The central section of the stained glass window depicts Jesus being baptized of John the Baptist – “then cometh Jesus of Nazareth of Galilee and was baptized of John in Jordan.” This section portrays the coming “up out of the water” following the baptism, the descent of “the Spirit of God” in the glory of light shed upon him, and the “voice from heaven, saying, ‘this is my beloved Son, in whom I am well pleased.’ ” Jesus is praying, conscious of the nearness of the father. John stands closely observant of what is taking place so that he may be a true witness to “bare record, saying, ‘I saw the spirit descending from heaven like a dove, and it abode upon him, the same is he which baptizeth with the Holy Ghost. This is the Son of God.”’ The other witnesses are reverent or amazed at what has taken place, convinced or in doubt as to the real significance, and wondering if they “behold the Lamb of God, which taketh away the sin of the world,” as proclaimed by John, who from this time steps into the background, while Jesus goes forward, completing his mission. Below these words is the white marble topped baptistery; and in front of the baptistery is a beautiful large communion table given in memory of Frank S. Drown. Setting on the communion table are two candlesticks given in memory of Deacon James T. Nelle signifying the two natures of Jesus Christ, his divinity and humanity. ​ To the right of the communion table stands the lovely pipe organ, originally built by Hook & Hastings in 1911, updated with electronic circuitry in 1963. The Giura Memorial Church house was given by Dr. Arcadie Giura as a memorial to Gladys Elizabeth Giura. This building provides the pastor’s study, the church office, and the Lion’s Den Thrift Shop. “Stand Fast in the Liberty"
by historian​ J. Stanley Lemons, PhD.